The novelist Alexandre Dumas is sometimes called Dumas père (Dumas the father), in order to distinguish him from his son, also Alexandre Dumas, a playwright, sometimes called Dumas fils (Dumas the son). Dumas père is well known for his novels The Count of Monte Cristo and The Three Musketeers, while his son is somewhat less famous, particularly in North America. But in fact there was another Alexandre Dumas, the father of the novelist. Perhaps we should call him Dumas grand-père. 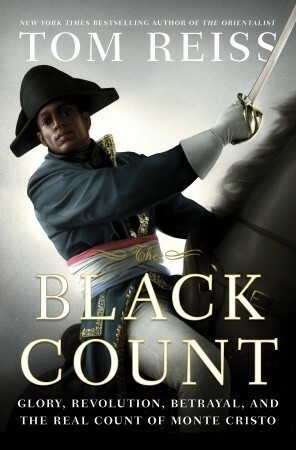 It is this formidable man who is the subject of Tom Reiss’s biography The Black Count. The first Alexandre Dumas was born to an itinerant French noble, Alexandre Antoine Davy de la Pailleterie, and his black slave mistress, Marie-Cessette Dumas on the French colony of Saint-Domingue (now Haiti) in 1762. He grew up in Jérémie, a largely mixed-race town as far as possible from the influence of the ruling class comprised of white sugar plantation owners. In 1776, Dumas’ near-penniless father decided to return to France, and sold his son into slavery, albeit with the right to repurchase him, apparently in order to get the boy passage to Europe. His siblings were not so lucky. When he disembarked in France, where slavery was illegal, Dumas became a free man. As a person of colour, Dumas arrived in France at a peculiar moment in history, when rising Republican ideals would enable him to achieve incredible military acclaim despite his race, eventually becoming a general in the French Revolutionary Army. Although it was still difficult for mixed race men to claim noble titles, Dumas was a count, and perhaps even a marquis after his father’s death, though he had left that life behind. He obtained a traditional French education supported by his father, but when he entered the army as a private, rather than an officer, despite his father’s protests, he took up his mother’s name. Formerly known as Thomas-Alexandre Davy de la Pailleterie, he became simply Alexandre Dumas. Within seven years he was commanding over 50 000 men, though he always did his best work in small patrols and skirmishes. Unfortunately for Dumas, the window of opportunity was short, and when Napoleon rose to power, the fortunes of the gens de couleur did not rise with him. Dumas was part of Napoleon’s expedition to Egypt, and was left behind there when the soon-to-be-Emperor departed unexpectedly. Making his own way back to France, Dumas was captured and imprisoned in Italy for two years. He was finally released and returned to France just as Napoleon rose to power. He was unable to gain readmission to the French army, and he died at home, likely of stomach cancer, in 1806. His life became the inspiration for many of his son’s novels, particularly The Count of Monte Cristo. Dumas’ life spans an intriguing and tumultuous period of French history, including the final years of the monarchy, the French Revolution, and the early years of the Napoleonic Empire. As such it is necessarily as much a history of France as a biography of Dumas, with particular attention paid to issues of race and slavery. Indeed, Reiss’ particular attention to these issues is the distinguishing feature of this book. At 200 years remove, there is a limit to how much can be pieced together about Dumas’ life from the remaining documents. Fortunately, Reiss’ historical overviews are entertaining and fast-paced, making The Black Count incredibly accessible for the general reader. He achieves this, to some extent, by playing up a slenderly supported personal rivalry between Dumas and Bonaparte during their time in the army. The remainder of the narrative is fleshed out with entertaining historical details, amusing imagined conversations from the papers of Dumas père, and tales of Reiss’ research travails. Although the personal rivalry is a matter of some speculation, Napoleon’s regressive policies with regards to race are a matter of historical record. While Reiss refers often to the documents Dumas père wrote about his father, he does not, rely too heavily on them. Reiss often counterpoints to stories of Dumas père with other available historical documents, in order to determine whether the novelist was looking back at his father through rose coloured glasses. Reiss paints a clear picture of a young man very much in awe of his father—who died when he was only four years old—but it is also clear that the historical record bears out General Dumas’s sterling reputation. Errors or revisions in the accounts of Dumas père tend to show his father getting the better of a situation in which he was discriminated against or humiliated, as opposed to glossing over faults in his father’s character. However, as evidenced by Reiss’s extensive research, the life and legacy of General Dumas hardly needed to be embroidered or polished by his son, for all that he was fond of doing so.